Back in the halcyon days of 1995, Pepsi launched their aptly titled “Drink Pepsi, Get Stuff” campaign that allowed customers to earn points on every Pepsi product they bought and then exchange them for things like Pepsi branded t-shirts and hats. The promotion was a roaring success and resulted in nothing of note happening whatsoever… unless of course you count the guy who sued them because they refused to exchange 7,000,000 Pepsi points for a Harrier Jet. The man in question was John Leonard and in the later months of 1995 he turned on his TV and saw this ad announcing the Pepsi Stuff promotion. For those who aren’t interested in watching the advertisement, it essentially shows a teen on his way to school, highlighting items one can buy with Pepsi points, such as a Pepsi T-shirt for 75 points, a leather jacket for 1450 points, etc. Upon seeing the commercial, Leonard, a 21 year old business student, did a little research and came to a startling conclusion- the Pepsi Harrier giveaway was actually an amazing deal at only 7,000,000 points. You see, in 1995, the value of a single Harrier Jet was about $33 million, give or take a few million depending on whose estimates you want to use. This meant that even if every 2 litre bottle of Pepsi only awarded a single point (in reality many bottles and cans offered more depending on where they were purchased), the Harrier would still only cost about $7 million in real money. To confirm there were no loopholes here, Leonard got his hands on a Pepsi Stuff prize catalogue. While no Harriet Jet was listed there, he did notice it stated in the small print that if a person already had 15 Pepsi Points, they could purchase an unlimited number of additional points towards any item they wanted for 10 cents apiece. This meant Leonard could actually effectively purchase the Harrier for a mere $700,000, and wouldn’t need to pre-purchase millions of dollars of Pepsi products to do it, making the whole business venture significantly less risky from a financial standpoint. And so it was that on March 27th of the following year, Leonard sent 15 Pepsi Points, an order form with the words “1 Harrier Jet” written in the item description, and a cheque for $700,008.50 ($699,998.50 for the remaining 6,999,985 points and $10 for shipping and handling) to the required address and waited. Pepsi, upon receiving the order, sent the cheque back with a letter explaining that the Harrier Jet was “not part of the offer”, nor was it included in the prize catalogue, and that its inclusion in the advertisement was merely intended as “fanciful” addition to make the ad more entertaining. The letter also included a bunch of coupons to apologise for “any misunderstanding or confusion”. Of course, Leonard was dead serious, in the previous year having managed to convince five unnamed investors to back his little venture. When later asked by the news about why he was so intent on getting a Harrier Jet, Leonard explained that as a member of the so-called “Pepsi generation” the company was advertising to, the “notion of owning a Harrier Jet appealed to him enormously”. Of course, with investors involved, it’s far more likely the group was simply looking for a large out of court settlement. Your letter of May 7, 1996 is totally unacceptable. We have reviewed the video tape of the Pepsi Stuff commercial… and it clearly offers the new Harrier jet for 7,000,000 Pepsi points. Our client followed your rules explicitly… This is a formal demand that you honor your commitment and make immediate arrangements to transfer the new Harrier jet to our client. If we do not receive transfer instructions within ten (10) business days of the date of this letter you will leave us no choice but to file an appropriate action against Pepsi. Oddly, rather than reply themselves this time, Pepsi forwarded the letter to the ad company responsible for the commercial, who replied to Leonard stating that the offer “was clearly a joke”, adding that they found it hard to believe anyone had actually taken it seriously. However, perhaps at least being a little nervous over the issue, in order to avoid copycat lawsuits, Pepsi promptly changed the price of the jet in the ad from 7,000,000 Pepsi Points to 700,000,000. But they still had to deal with Leonard, who sued Pepsi for fraud, breach of contract and deceptive advertising. The case limped through the courts for three years. While the court of public opinion was strongly on the side of Leonard and his investors- after all, the commercial clearly stated that if you acquired seven million Pepsi points, you could exchange them for a Harrier jet- the court that actually had power to issue a ruling was not. The issue was finally settled in 1999 with the judge concluding that “no objective person could reasonably have concluded that the commercial actually offered consumers a Harrier Jet”. Advertisements of goods by display, sign, handbill, newspaper, radio or television are not ordinarily intended or understood as offers to sell. The same is true of catalogues, price lists and circulars, even though the terms of suggested bargains may be stated in some detail. It is of course possible to make an offer by an advertisement directed to the general public, but there must ordinarily be some language of commitment or some invitation to take action without further communication. 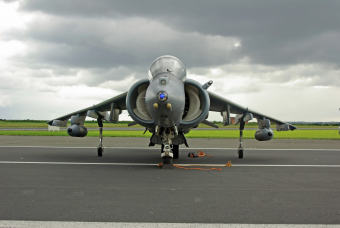 Finally, the courts ruled that not giving Leonard the Harrier wasn’t in breach of contract as no written agreement between the two parties involving the giving or receiving of a jet had been drafted or signed. As Arthur Linton Corbin notes in Corbin on Contracts, “There would be no enforceable contract until [the] defendant [Pepsi Co.] accepted the Order Form and cashed the check.” As Pepsi did neither, there was no breach of contract. This all leaves one wondering, had the court ruled otherwise, would Pepsi have been able to give Leonard the jet? The answer, according to Pentagon spokesman Ken Bacon, was decidedly no. In response to Bacon’s assertions, Leonard stated that he would take a Harrier Jet “in a form that eliminated [its] potential for military use”. The U.S. military has in the past, for instance, sold tanks to civilians after their weaponry was removed. In response to that, Bacon claimed that doing the same to the jet would strip it of its ability to fly, rendering it useless. That’s not to mention that a Harrier Jet uses a massive amount of fuel per minute of flight, varying depending on what you’re doing at the time, and requires millions of dollars of maintenance over the course of its lifetime, both of which make it prohibitively expensive for any but the richest of civilians to operate. But, of course, it is likely Leonard and his investors were never actually interested in the jet, just the potential payout if the court ruled in their favor. Leonard attempted to appeal the court’s decision in 2000, with the ruling ultimately upheld. Is There Really a Point to Pepsi Aircraft Offer? The best vertical take off and landing system in the world,maybe F-35 has better and new system.I admire it.